NOSE-ABLES A Triple Crown THE BALVENIE WINS ON THREE FRONTS IN 2012 story and photo by Richard Carleton Hacker C Lorne Cousin, Balvenie's new Brand Ambassador for "everything west of the Mississippi," toasts the crowd with The Balvenie's equally new 17 Year Old Double Wood. "It's like having dessert in a glass," he says. omparing single malt Scotch whisky with horse racing, The Balvenie—the family-owned Speyside distillery that controls every aspect of its whisky-making, from barley to bar- rels—has achieved the equivalent of a Triple Crown this year. First, 2012 marks Master Blender David Stewart's 50th anniversary with William Grant & Sons. He began as an apprentice in 1962 and has been the distillery's Malt Master for the past 38 years, thus becoming the industry's longest- reigning Master Blender. In addition to creating numer- ous award-winning spirits, he was the fi rst to implement the now widely accepted technique of "fi nishing" single malts in different barrels. "When David cre- ated The Balvenie Classic—the precursor of the 12 Year Old DoubleWood—in the early 1980s, no one else was fi nishing whiskies in casks," says Andrew Weir, The Balvenie Brand Manager. "So DoubleWood goes back to that signature style that David Stewart created." Which brings us to Balvenie's second winner, the just- released 17 Year Old DoubleWood. This is The Balvenie's fi rst 17 Year Old expression to join their core range of single malts, alongside the 12 Year Old DoubleWood, 14 Year Old Caribbean Cask, 15 Year Old Single Barrel and 21 Year Old PortWood. Matured for 17 years in ex-bourbon barrels, the 17 Year Old DoubleWood is then fi nished for up to six months in sherry casks. Befi tting Stewart's golden anni- versary, this golden-brown whisky is subtle yet spicy and possesses Balvenie's signature honey tones, while brimming with caramel, dried fruits and green apples. 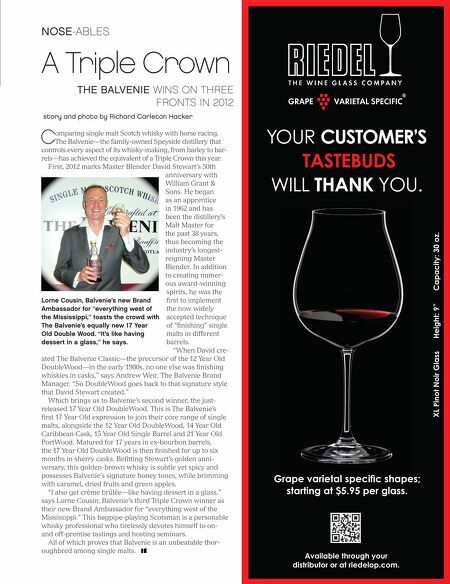 "I also get crème brûlée—like having dessert in a glass," says Lorne Cousin, Balvenie's third Triple Crown winner as their new Brand Ambassador for "everything west of the Mississippi." This bagpipe-playing Scotsman is a personable whisky professional who tirelessly devotes himself to on- and off-premise tastings and hosting seminars. All of which proves that Balvenie is an unbeatable thor- oughbred among single malts. YOUR CUSTOMER'S TASTEBUDS WILL THANK YOU. Grape varietal speciic shapes; starting at $5.95 per glass. distributor or at riedelop.com. Available through your XL Pinot Noir Glass Height: 9" Capacity: 30 oz.